For sparkling clean floors, choose the right products and tools for your flooring materials. Kitchen floors are a potluck of dirt, grunge, and grime. 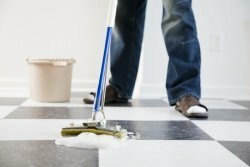 Cleaning kitchen floors, and keeping today's fabulous flooring materials - linoleum, vinyl, and hardwood - sparkling like new requires a special cleaning regimen. Using the right cleaners for the job is critical in keeping these specialty surfaces shining safely. But which cleaning products and tools are right for your floors? Here are my recommended products and tools for cleaning kitchen floors by surface type. Keeping linoleum really clean requires regular damp mopping (use very little water, which can make the surface brittle) or dry dust-mopping to rid the surface of grit and dust before it's ground in. To keep linoleum shiny and lustrous, each year apply a wax such as carnauba paste wax to seal and protect the surface. For heavy wear areas, you may need to wax once a month.